Richard Harris was an actor who scored a surprising smash hit in 1968 with MacArthur Park. 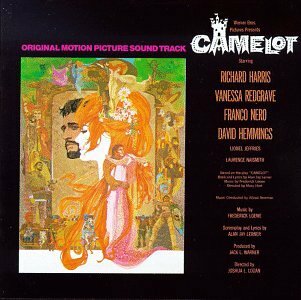 But his performance in the 1967 film musical Camelot is likely what convinced Harris that he could record an album. It was in the 1963 film The Sporting Life that Harris was first noticed. He was very similar to guys like Richard Burton and Peter O'Toole. So when Joshua Logan was looking to direct a film version of the Lerner and Leowe musical Camelot, he cast Harris as King Arthur and Vanessa Redgrave as Guenevere. Of course Camelot was a Broadway success in 1959 starring Richard Burton and Julie Andrews. By the time Warner Bros. turned Camelot into a film, Burton and Andrews would have been too expensive. So casting Harris in a role made famous by Burton was good for Warners and for Harris. Though Camelot was not received well by critics, Harris and Redgrave were praised for their performances and Harris won a Golden Globe. It also convinced Harris that he could record a pop album. And soon after this he met songwriter Jimmy Webb at a party and they produced the smash hit MacArthur Park. Camelot was a box office success and the soundtrack is available as a budget CD. Harris returned to play King Arthur in Camelot in a 1981 stage production on Broadway and then in London. It aired on HBO. Here's Richard Harris performing How To Handle A Woman in the 1967 film Camelot.